We are a leading supplier of Air Handling Unit. This type houses a set of spray nozzles which inject the water into the air stream in the form of a fine atomized mist (by breaking the water into the fine particles we increase the surface area by multiple folds for the same volume of water). In this system, the water is in direct contact with the airflow unlike the cellulose type system. When a single bank is provided (depending upon the efficiency required) the spray is injected in the opposite direction of the airflow. In a double bank system, the banks are kept opposite to each other. The entire plumbing is done with the help of galvanized pipe. The pump can be located inside or outside the unit. Air Supply Unit (ASU) is equipment used to circulate, supply or replace air from spray paint booth. Air Supply Unit is commonly known as Air Replacement Plant (ARP), Air Handling Unit (AHU), and Air Makeup Unit (AMU) etc. Air Supply Unit or Air Handling Unit was very popular in areas where the air has low humidity, and hotter climate, mainly to comfort the human conditions in such climate. As technology has changed for better development, even in the field of paint and painting equipment, more and more expansions have added up to make a dust-free painted product. To attain such a clean paint film on the product free from dust above 5 microns, Air Supply Units and Air Handling have become a necessity of today’s market. 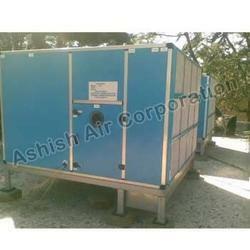 Ashish air Air Supply Unit (ASU) comprises series of filters & eliminators. Ashish air Engineering Air Supply Unit (ASU) uses the atmospheric air from outside, refines the air, and supplies it to the Paint booth via ducting, thus creating a constant flow of dust-free air into the paint booth. The volume of air supplied from the Ashish air Air Supply Unit (ASU) also helps to maintain a positive pressure in the paint booth, thus not allowing external dust around the paint booth to enter into the paint booth. Ashish air Air Supply Unit (ASU) creates an enclosed environment safer for workers by facilitating the elimination of toxic fumes. Ashish air Air Supply Unit (ASU) is not only used to provide makeup air for the paint booth but also used as a spot cooling device for the workers in molding shops, assembly shops, and other hotter areas. Ashish air engineering is capable to manufacture customized Air Replacement Plants (ARP), in metallic & civil constructions. Various options such as pre-coated galvanized sheets, plain galvanized sheets, aluminum & SS 304 & SS 316 sheets in various thicknesses are available for an inner & outer skin of double skin panels. Drain pan made of SS 304 with a dual slope to facilitate immediate discharge of condensate. Base frame is made of galvanized steel with die-cast aluminum joints having lifting holes. Access doors are provided with hinges & locks made of self-extinguishing nylon for perfect air tightness.